After repotting a plant, it is often wise to “anchor” it firmly so it cannot wobble around. 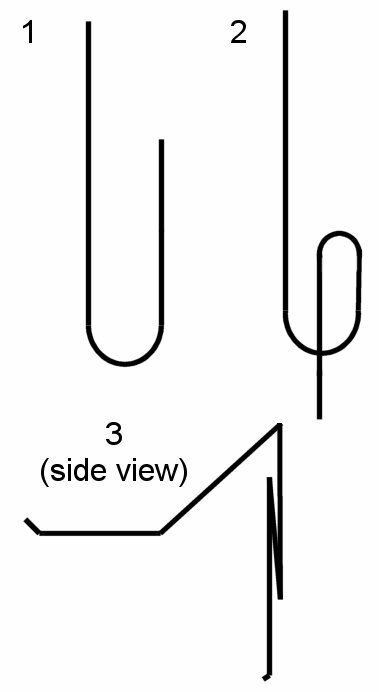 Using a straight piece of heavy wire, bend a deep “J”, with the short part about 4″ in length. Bend the short part of the “J” back down through the middle of the first curve you made. Keep the wire as close to the original as possible, but you can always crimp it with pliers to “tighten” the grip. Bend the long, upper part over so it would poke back down in the pot. Flatten the length that will press down on the rhizome. Press the “loopy” part of the clip over the lip of the pot with the single wire running down along the inside wall. If you have a tall plant, you can stop at step 2 and tie it to the upright stake.